Read the instructions posted on this page to learn how to access the official job application (online version). Numerous current openings can be applied for by creating an online account and going through the application process. The instructions posted below detail how to create an account, search for current openings, and fill out/submit an application. About the Organization: The DEA (Drug Enforcement Administration) is an American federal agency responsible for enforcing the country’s drug laws, conducting law enforcement investigations, etc. The administration was founded in 1973 and employs more than 10,000 people. 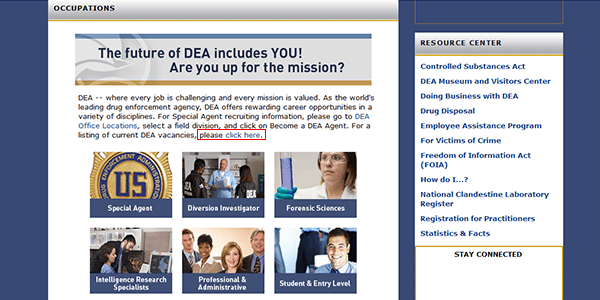 Step 1 – Start by going to the DEA’s main employment page/site. Click here to have the page load in a new tab/window. Step 2 – Press the “click here” link to go to the current list of vacancies within the agency. Step 3 – Enter a keyword into the first input field and a location into the second field. Press the “search” button to load the list of results. Step 4 – Scroll down the page to view the list of current openings. Click the title of the job that you’re interested in submitting an application for to go to the next part of the process. Step 5 – Review the job description. 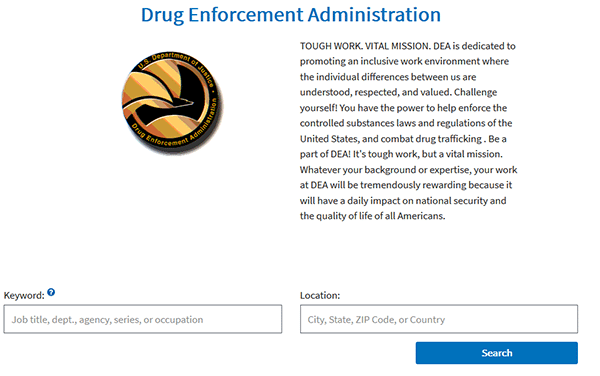 Follow the on-screen instructions to complete the online application process for the DEA. Note: You will need to create a usajobs.gov account in order to apply for any position within the DEA.